Magento has become an important player in global ecommerce arena with brands such as Samsung, Nike and Ford as the users of this excellent ecommerce platform. The most important aspect of this success is the 800k+ members of its community who regularly test and contribute to various themes and features. Every successful online Magento store has a highly capable hosting infrastructure that ensures smooth performance and maximum uptime regardless of the demands on the resources. As many store owners and administrators would attest, if the underlying hosting solution is not robust enough, all the benefits of using magento as the ecommerce platform are lost! Recently, I came across Cloudways, a managed hosting provider for Magento stores. Since they were offering a free trial of 14 days, I decided to try out their platform. I soon realize that the managed hosting solution means that I do not have to worry about server related issues and can devote my time exclusively to the day-to-day challenges of running a Magento based business. Right now, Cloudways offers the choice of five market-leading infrastructure providers - Amazon Web Services (AWS), Google Compute Engine (GCE), DigitalOcean (DO), Vultr and Kyup. On top of this, you have the choice of 41+ locations for hosting your store. Magento requires a glitch free performance and Cloudways ensures this through a very robust stack known as Thunderstack. 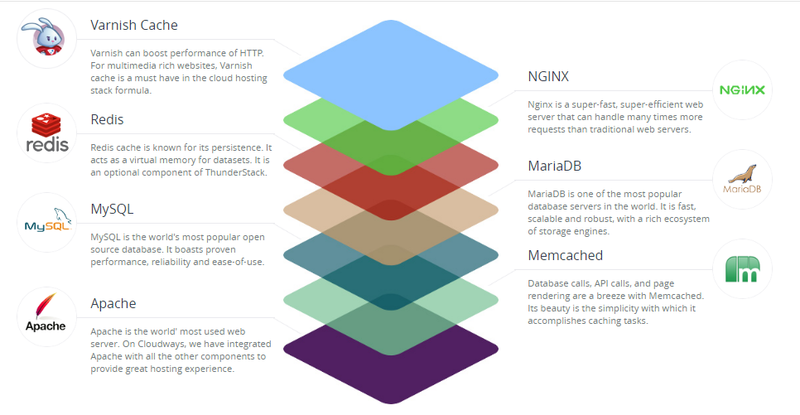 Thunderstack comprises of Nginx, Varnish, Apache, Memcached, and Redis Cache. 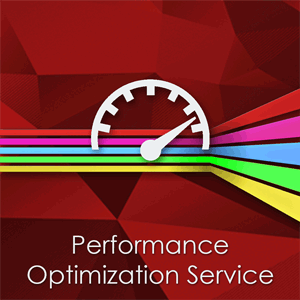 All these components combine to provide a streamlined performance for your Magento store. A test run showed that Magento stores performed almost 100% better on Cloudways when compared to other hosting platforms. Initially, I was worried because the Thunderstack has so many components that require individual attention. However, since Cloudways is a managed cloud hosting platform, I do not have to worry about managing the underlying services and components. Thus, my online Magento store could take full benefit of Thunderstack without worrying about software patches and hardware failures. The primary focus of Cloudways is on security of the Magento stores. I observed two distinct levels of security. The first was the 1-click installation of FREE SSL certificate by Let’s Encrypt. SSL certificates are an essential requirement for online stores. Once the SSL certificate is installed, you will see the green padlock icon in the address bar of the browser. All communication between the customer and the Magento store is encrypted by the SSL certificate and thus protected from all intrusions and interceptions. On the level of servers and services, Cloudways team promptly applies security related patches for all hardware and software components of the Thunderstack. This means that the hardware, software and OS remains updated to the latest security standards. A very interesting feature of the Cloudways Platform is the CloudwaysBot that keeps you updated with the condition of the server. As soon as an issue arises, CloudwaysBot immediately notifies you through several channels. Cloudways is a user-centric platform, with a host of features ensuring that your Magento store is ready for business throughout the year without any issues. The management console is easy to use with detailed tabs for all aspects of server and application management. Many options and features are just a few clicks away. This way, the store owners and administrators could easily setup and alter various services and options without any issues. In case of a disaster, your Magento store is safe, thanks to the ever-vigilant backup system of the Cloudways. This system ensures that there is always a recent copy of your Magento store at an offsite location. When disaster strikes, you could easily restore the data and things are back to normal in a matter of minutes. Developers have an easy time working on the platform, thanks to the easy-to-use Cloudways API. Offering GitHub integration and a very flexible Playground, the API allows developers to setup third-party integration of the Cloudways Platform in their apps. Cloudways operates on a pay-as-you-go model. This means that users are charged only for the resources that they consume. The pricing plans for your Magento store could be as low as USD 7 per month including the infrastructure costs! Perhaps the best thing about Cloudways is that they do not abandon you after selling you the goods. They have excellent support that is accessible round the clock through several channels. The support is there for you even in the Holiday season that is the crunch time for Magento stores. I tried Cloudways for my Magento store and found them to be a very reliable host. The Cloudways managed cloud hosting platform ensured that I could remain focused on the store related issues without worrying about the underlying technical issues. If you wish to host your Magento store on a hassle free platform, do sign up for a 14-days FREE trial. This guest post is provided by Cloudways.